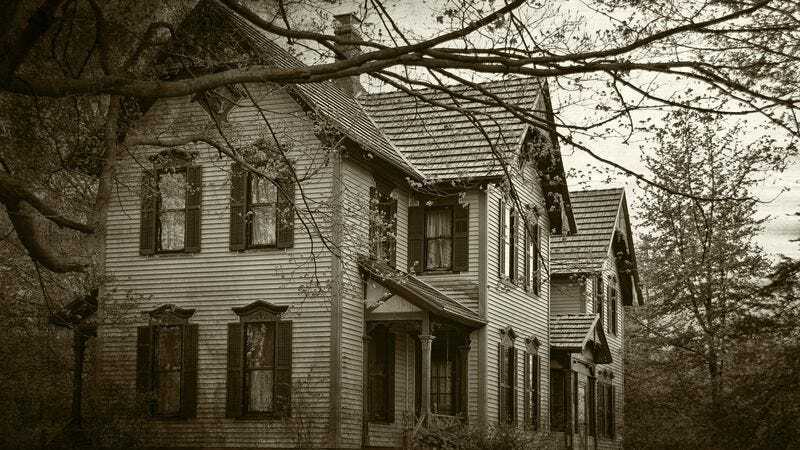 Buying your first haunted house is an exciting time, but it’s far from an easy one. Here are some things to look out for that’ll keep your accursed life running smoothly. 1. Your new silverware will always be floating: Buying your first house is a great opportunity to ditch those old mismatched spoons and forks you’ve had since college, but get ready for your nice, new stainless steel silverware to be suspended impossibly in the air. 2. The revolving bookcase constantly needs maintenance: This piece of junk is always getting stuck or revolving spasmodically and freaking everyone out. Plus, you have to hire a specialized serviceperson with these kinds of bookcases, and they always screw you on the price. 3. The elderly shut-in next door will never stop warning you of the unnatural murders that happened in your house 30 years ago: Ugh…we get it, Mrs. Prescott, an entire family was killed by their deranged father after he was possessed by a demonic spirit. Can we just go back to gardening in peace? 4. Property taxes are THE WORST: Between the mortgage payments and the ritualistic blood sacrifices, you’d think that was already more than enough, but no, the city has the gall to tack on another 1.38 percent in property taxes. Unbelievable. 5. You’ll never hear so much dissonant piano in your life: If you think you’ve heard ominous, discordant pianos echoing in a cavernous hall in your old apartment building, think again. The constant blaring cacophony of a spirit playing the piano is something that you’ll just have to get used to. 6. You’ll become hyper-aware of strange, unexplained fluctuations in the real-estate market: Whether it’s a sudden, ominous spike in market prices or the strange lack of buyers for the reasonably priced house down the road, you’ll find yourself constantly seeing things in the market that just can’t be explained. 7. You’ll have to be creative with storing your belongings: Because the previous tenants left behind so many cursed items in the basement and attic, reorganizing the piles of amulets, hexed diaries, and creepy dolls filling those areas is going to be a larger struggle than you think! In the market to buy your own home? Find the perfect one—haunted or non-haunted, it’s up to you—on Trulia.